The Croww's Nest: Like a Bull in a China Shop? My wife took me and the kids to Montreal for my 39th birthday last November, and I snapped this pic in one of those innumerable curio shops that are scattered throughout the Chinatowns of the world. There I am, perusing the many rows of wacky and tacky tchotchkes when I round the corner and see this. 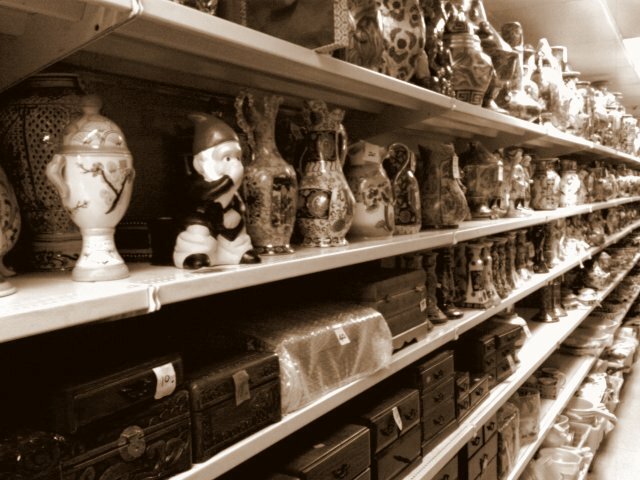 Stretching nearly the length of the shop is a floor to ceiling shelving unit, filled with fairly elegant vases and jewelry boxes, hand-painted, golden highlights, the works. Despite the mass-produced feel to most of the products, it really was quite a remarkable collection of high quality trinkets. Yet, smack dab in the middle of this whole display was this curious little dwarf, sitting on the pot, grunting and holding his nose. Ah, now I remember the phrase I was looking for. Like a turd in a punchbowl.